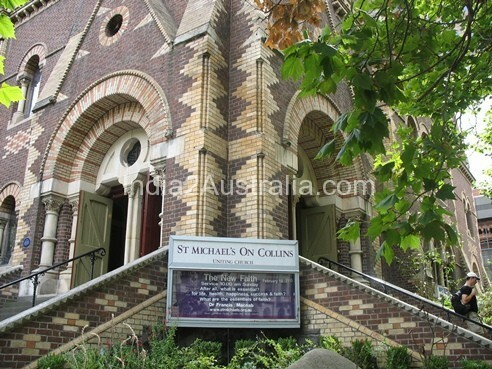 St. Michael’s Uniting Church is in Collins St in central Melbourne, Australia. Originally known as the Collins Street Independent Church, a Congregational Union of Australia church, and later Collins Street Uniting Church, it has become well known as a centre of liberal theology and political radicalism under its outspoken minister since 1971. The heritage listed building was completed in 1867. The architect Joseph Reed , also designed the Melbourne Town Hall and the Royal Exhibition Building in the Carlton Gardens and Scots Church. It is a unique design with no precedent. Founded by the Congregationalists, the first permanent church in the Port Phillip Settlement was built on this site in 1839, and then demolished in 1866. Exterior constructed in polychrome brickwork with square tower. The sloping floor, the gallery and the coved ceiling provide a theatrical interior. The circular interior accommodates 1200, designed so that all can see and hear the preacher. The present manual organ of nearly 2500 original pipes incorporates some of the original 1867 organ. These were installed in 1988, the 150th anniversary of the first church and Australia’s Bicentenary. In 1977 the Independent Church became part of the Uniting Church in Australia. In 1990, it was renamed St Michael’s to emphasize its mission. The large congregation responds enthusiastically to a relevant and practical religion.